Isaac I Komnenos or Comnenus (Greek: Ισαάκιος Α΄ Κομνηνός, Isaakios I Komnēnos), c. 1005–1061, was Byzantine Emperor from 1057 to 1059, and the first reigning member of the Komnenos dynasty. 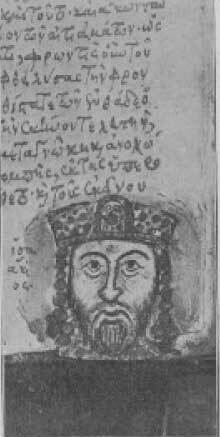 He was the son of Manuel Komnenos Erotikos, an officer of Emperor Basil II, who on his deathbed commended his two sons Isaac and John to the emperor's care. Basil had them carefully educated at the monastery of Stoudion, and afterwards advanced them to high official positions. During the disturbed reigns of Basil's seven immediate successors, Isaac by his prudent conduct won the confidence of the army. From 1042 to 1057, he served as commander of the field army in Anatolia. In 1057 he rebelled in Paphlagonia and joined with the nobles of the capital in a conspiracy against Michael VI. After the latter's deposition, Isaac was proclaimed emperor, founding the new dynasty of the Komnenoi. Patriarch Michael Keroularios crowned Isaac I emperor on September 1, 1057, taking much of the credit for Isaac's acceptance as monarch. The first care of the new emperor was to reward his noble partisans with appointments that removed them from Constantinople, and his next was to repair the depleted finances of the empire. He revoked numerous pensions and grants conferred by his predecessors upon idle courtiers, and, meeting the reproach of sacrilege by Michael Keroularios with a decree of exile in 1058, he appropriated a proportion of the revenues of the wealthy monasteries. Isaac's only military expedition was against King Andrew I of Hungary and the Pechenegs, who began to ravage the northern frontiers in 1059. Shortly after this successful campaign, he concluded peace with the Kingdom of Hungary and returned to Constantinople. Here he was seized with an illness, and believed it to be mortal. This situation was exploited by the courtiers, led by Michael Psellos, who influenced Isaac to appoint as his successor Constantine Doukas, to the exclusion of his own brother John Komnenos. Isaac abdicated on November 22, 1059, against the wishes of his brother and of his empress Catherine. Like Isaac, his wife and daughter entered a monastery. Although he recovered, Isaac Komnenos did not resume the throne, but retired to the monastery of Stoudion and spent the remaining two years of his life as a monk, alternating menial offices with literary studies. His Scholia to the Iliad and other works on the Homeric poems are still extant. He died late in 1060 or early in 1061. Isaac's great aim was to restore the former strict organization of the government, and his reforms, though unpopular with the aristocracy and the clergy, and not understood by the people, certainly contributed to stave off for a while the final ruin of the Byzantine Empire. Manuel Komnenos, who died before 1059.